NEW DATES- SAME CAYE CAULKER LOBSTER FEST!!! Team members from the Veteran’s Football Team on weekends usually got together and socialized after football games and the idea of forming a football club including friends and families was suggested. The club’s idea materialized and was organized under the captainship and vice captainship of Mr. Porfelio Guzman and Mr. Jerry Badillo Jr., both lobster fishermen of Caye Caulker. As well, most of the team members were fishermen. So it was these same football club members/fishermen and Mr. Neil Bradley who came up with the idea of celebrating the opening of the lobster season by having a lobster festival. The management of the team supported the idea and organized the first festival on the last week of July 1994. Ever since, the Lobster Festival was celebrated every year and each year, it became bigger and better organized. The opening of the Lobster season was changed from July to the month of June, hence the change of the festival dates. The Festival became the biggest event celebrated on the Island. The Caye Caulker Village Council and the Caye Caulker Roman Catholic School joined forces along with the Veteran’s Football Club to make it the Caye’s number one event that attracts Belizeans and tourists alike. The income generated from the festival was shared with the Village Council and the school for the betterment of the beautiful island. Today, under new management, Caye Caulker Lobster Fest is still the number one event celebrated on Caye Caulker and has attracted international attention from many countries. 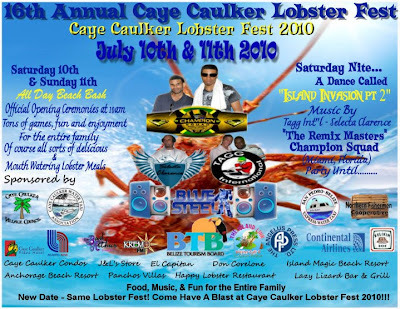 This year is set to be our 16th Annual Caye Caulker Lobster Fest to be held on the 25th, 26th, and 27th of June 2010. The event is anticipated to be one of the biggest Lobster Fests ever yet with entertainment all the way from Miami, Florida, as well as local Belizean entertainment. The Festival kicks off Friday the 25th with the crowing of Miss Lobster Fest 2010 and lasts until Sunday 27th with an all day beach party and the closing of the festival. Highlights and each and every year include our Grand Opening Ceremonies held on Saturday the 26th, displays of live Lobsters, weighing of the biggest Lobster brought in by our local fishermen, the main dance event hosted on Saturday night, and of course all sorts of delicious and mouth watering Lobster dishes. The atmosphere at Lobster Fest is always a festive one with fun activities and enjoyment for everyone, from the youngest to the oldest member of the family. The Lobster Fest Committee takes this opportunity to invite one and all to be a part of the experience and join in the 16th Annual Caye Caulker Lobster Fest. There will be lots of food, fun and music for the entire family. Come on out and have a blast! See you there! If not, catch live highlights on KREM Radio, the foundation radio station of Caye Caulker Lobster Fest, on Saturday, June 26th and Sunday, June 27th from 1:00 p.m. – 4:00 p.m. both days. 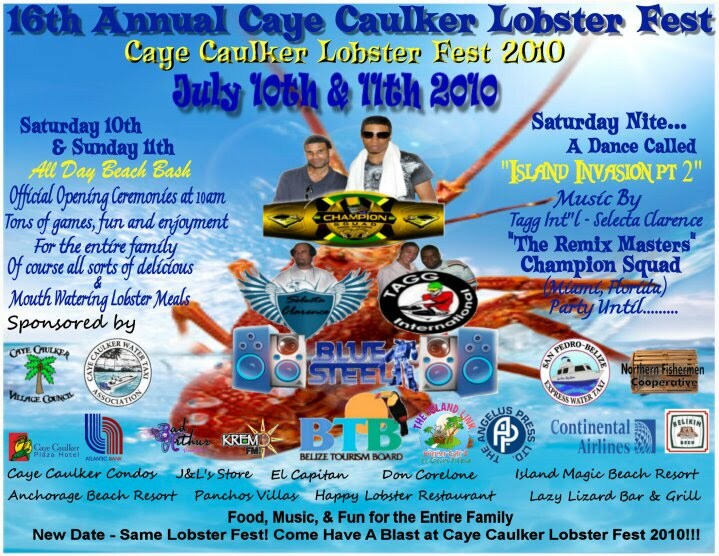 Please note that the Caye Caulker Lobster Fest was postponed for July 10th & 11th, 2010 due to the passage of Tropical Storm Alex.